Here is a recipe that is ubiquitous on the menus of most restaurants around the Indian subcontinent but nay impossible to find in your average ‘Indian’ takeaway here in the UK. 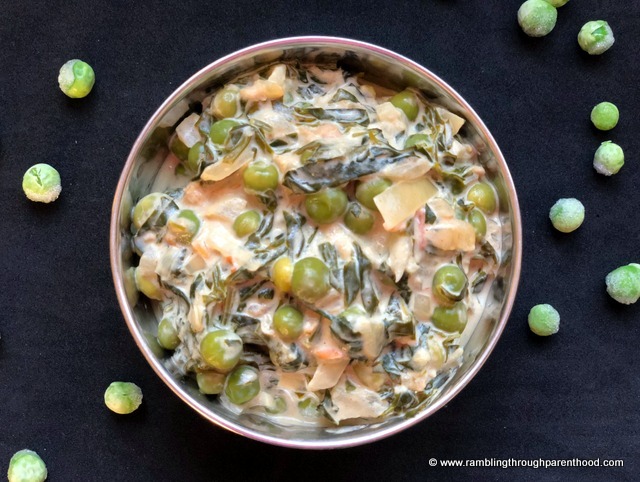 It combines the fragrant bitterness of fenugreek (methi) leaves with the sweetness of green peas (mutter) and serves them up in a rich, creamy (malai) explosion of green and white. Fenugreek (or Methi, in Hindi) is a type of green leafy vegetable and a rich source of iron and calcium. The dried seeds are extraordinarily bitter, but being rich in iron, are traditionally transformed into sweet delicacies for pregnant and lactating mothers. My mother lovingly fed me these methi laddoos when I was breast-feeding. Back to the Methi Mutter Malai. I am not selling this recipe for its nutritional value. Far from it. 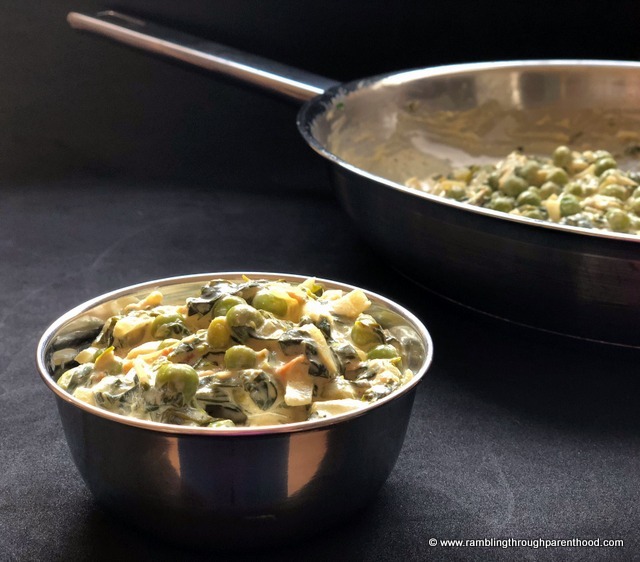 By the time you have added lashings of single cream to the fenugreek and peas, there is very little to recommend this curry to the diet-conscious. But then, this is not a weight loss recipe. This is comfort food at its delicious best – something to eat and savour for its rich flavours when you are craving a hearty meal. Or when you decide it is okay to treat the family to a sumptuous, home-cooked vegetarian curry. The most tedious part of this recipe is destalking the fenugreek leaves. That’s where the complexity ends, for the recipe that follows is as easy as can be. Trust me, I know a thing or two about making Indian cooking easy! I tend to buy fenugreek (or methi, as it is called in Hindi) fresh from the local Asian grocery shop or if I have the time and feel inclined to make the trip, from the Bolton market. The leaves are attached to thick stalks and conceal little yellow flowers at the crown. Some eat it all, leaves, stalks and flowers. Some prefer one or the other. I am fastidious about not including either stalks or flowers and like to use only the gorgeous green leaves in my methi recipes. You can pick up a packet of frozen methi from your local supermarket if fresh leaves aren’t forthcoming. 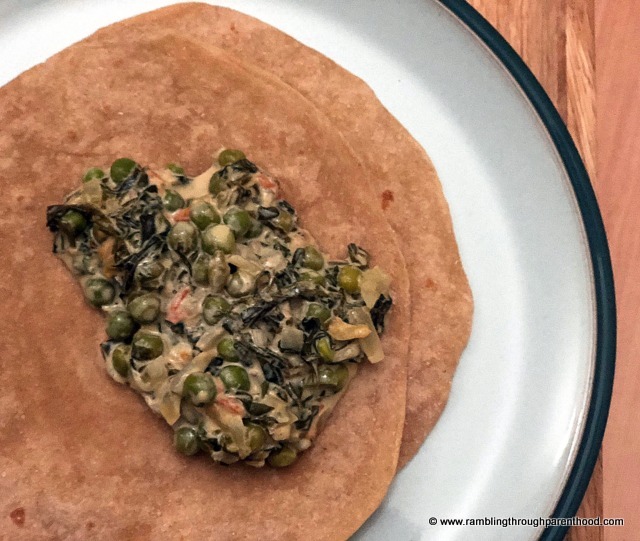 I would recommend this as a last resort, as frozen methi cannot hold a candle to the fresh thing when it comes to flavour and texture. 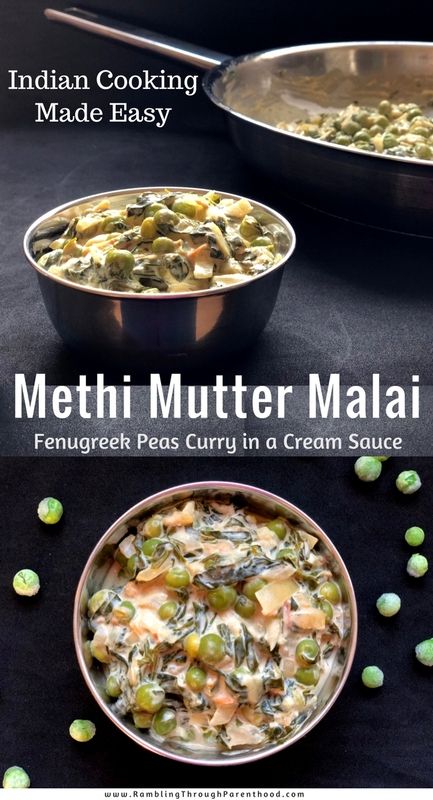 Indian Cooking Made Easy - Methi Mutter Malai (Fenugreek Peas Curry in a Cream Sauce) doesn’t get easier than this! Start by heating oil in a thick-bottomed frying pan. Once hot, add the onions and sauté on moderate heat for 2-3 minutes or till translucent. Next add the ginger-garlic paste and continue to sauté for another minute. Stir intermittently to ensure nothing sticks to the pan. Add the chopped tomatoes and cook for 4-5 minutes or till the tomatoes soften and reduce. Sprinkle over the salt and stir to allow an even spread. I prefer to add salt at this intermittent stage rather than at the end. It seems to ensure uniform mixing with the curry sauce. Add the frozen peas and let them cook for 3-4 minutes. Continue to stir intermittently. Now toss in the fenugreek leaves. The methi will shrivel up almost instantly. 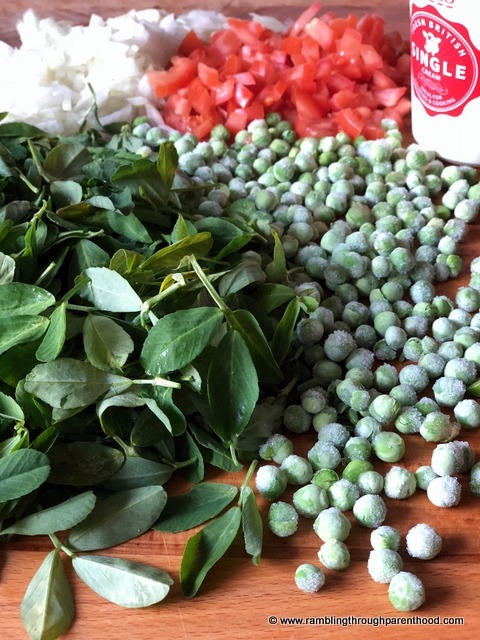 Cook for 5-7 minutes till the peas and methi both change colour. The methi goes darker, the peas, lighter green as they cook. Turn down the heat to a low setting before adding the cream. Sprinkle in ½ tspn red chilli powder (this is not your typical fiery curry, so that is enough heat). Stir, cover and simmer on low heat for 20-25 minutes. I hope I have given you enough to convince you that Indian cooking can be made easy. Hope you enjoy making and eating this Methi Mutter Malai.